My Papa King studied it and preached it. So does my Daddy. And my hubby does, too. They all went to school and learned from wonderful seminary professor who not only had insight into the original words, but had a love for the Bible as the authority in their lives. Thankfully, these teachers imparted not only a passion for studying God’s word, but a passion for living it. And I have been the recipient of their dedication to study God’s word diligently and their quest for Truth in their daily lives. My interest in Bible study has developed through the years. My personality also plays a role in my “desire to know”. I like to be right. 🙂 So, admittedly, my study of the Bible and my search for the truth is sometimes mixed with the self-seeking motive of knowledge itself. And I believe that this kind of knowledge of the scriptures – knowledge apart from the Spirit – can be detrimental to a person’s life. It sends a subtle, false message that a person is walking in the truth. But there is a big difference in walking in the Truth and just knowing truths. Yesterday I was pondering all of these things. I prayed again for God to put His truths in my heart that I would know Him and live for Him. That it would be much more than mere knowledge about Him. 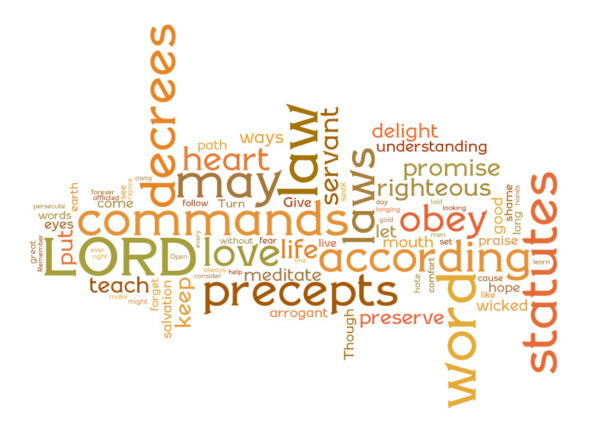 In Psalm 119, the psalmist speaks about God’s precepts, and about obedience and understanding. But he also speaks of the sweetness of God’s word (like honey) and of hope and deliverance and guidance and love. When God’s word penetrates to my inner person – that’s when studying has accomplished its purpose. I have personally witnessed the damage that Bible knowledge alone can do. The Bible has been misused and misquoted to convince people to do terrible things, in the name of God. I know that even a sincere believer can fall prey to misusing certain verses to convince themselves of something that they want to believe or give themselves permission to do something they want to do. We must be careful and prayerful when we study. I read book reviews often. I think that authors are sometimes misunderstood. It’s hard to always know what a person actually means by the written word alone. Usually, because we don’t know them, we are unable to ask the author what they meant in certain paragraphs that may be confusing to us. I am so thankful that it’s not like that with the Bible. I know the author personally. As Nicole C Mullen sings, “I spoke with Him this morning.” But I must pray for discernment and humility. I must acknowledge His Spirit as my Teacher as I study. Sometimes, even when we pray and humbly seek to know His truths, we still miss it. But I’m so thankful that when I sincerely seek HIM that I always find Him. And over time – and it may take years of consistent study and prayer – I also find many answers to my questions. I don’t ever want to stop learning. But I pray that my learning will always be transforming my living. Oh, the depth of the riches and wisdom and knowledge of God! How unsearchable are His judgments and how fathomless His ways! For from Him and through Him and to Him are all things. To Him be glory forever!